Wood is a material that absorbs moisture which makes it more susceptible to rotting than other fence materials. The best plan for defense is having the proper plan for prevention in place. Taking the necessary measures to prevent rotting will not only extend the life and integrity of your fence, but it will also save you time and money in responding to rotting issues. Wood is one of the most popular, beautiful, and traditional choices for fencing. However, wood is a material that absorbs moisture which makes it more susceptible to rotting than other fence materials. With that said, when installing a wooden fence, use concrete fence posts, gravel boards, or concrete footing for the sections near the ground. This technique helps prevent moisture absorption, which will extend the life and integrity of your fence. Other materials that help prevent rot include cedar, juniper, redwood, and cypress. Treat your panels and posts with a preservative upon installation and during your annual maintenance routine. This process and the products used will seal the wood from environmental moisture and water from other sources, including your sprinkler system. Many types of wood are porous, and the preservative will take up space in those places where moisture normally would. When using concrete footings, you should slope the top of the concrete away from the fence. This technique will allow water to runoff and drain rather than pooling up around the surface of the wood. If water is allowed to pool up near the wood, it’s more likely to be absorbed into the fence and cause destructive rotting. 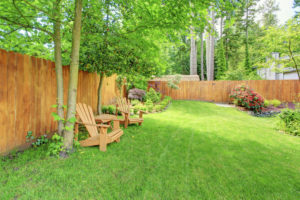 When doing lawn maintenance or even when the wind blows, leaves, grass clippings, and other debris will pile up around and against the base of your wood fence. These materials are often soaked with moisture from rain and even your sprinkler system. If left to sit for a while, that moisture will eventually be absorbed into the wood. Even as the vegetation itself begins to rot, it will spread through the tiny cracks of the wood and cause even more extensive damage. Keep your fence clear of debris so that it’s able to remain as dry as possible. This entry was posted on Friday, May 18th, 2018 at 8:48 am. Both comments and pings are currently closed.